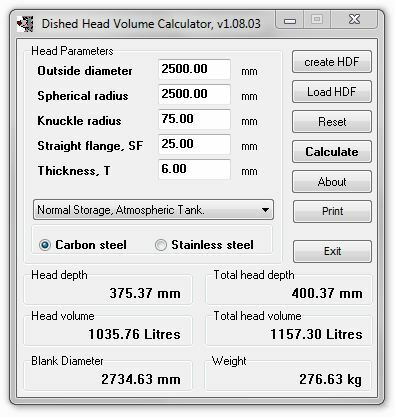 Useful Windows (tm) utility for the Volumetric calculation of dished heads (ends). Types: Normal Atmospheric (tank ends), EN.12285, Pressure Vessel 2:1, 6% & 10% Torispherical forms are all supported. Your head form parameters can be saved & retrieved at a later date. 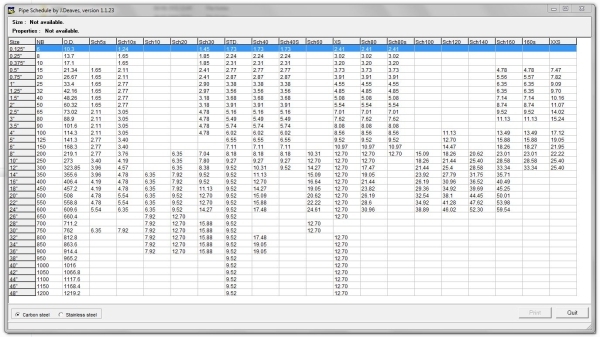 Useful Windows (tm) utility for Pipe Schedules/sizing contained within the ASTM specification, includes sizes from 1/8" up to 48". The user is able to insert additional sizes where required. Calculated values include: Pipe wall thickness (metric), nominal bore, outside diameter, internal diameter, weight per metre in either carbon or stainless steel, cross-sectional area, section modulus. moment of Inertia & radius of gyration etc.